Often times the difference between a good short game and one that consistently comes up short is finding the time to practice. At Southwest Greens, we invite you to remedy that problem by bringing your short game home with you. Our backyard putting greens promise to shrink your handicap through the force of sheer convenience. 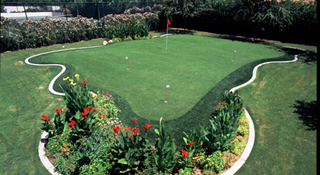 Made from the finest artificial grass in the industry and customized to fit your backyard, you’ll be amazed at how quickly the combination of easy access and increased practice time make you a consistent threat around the cup. Consider how often you make it out to the local practice green. Time and responsibilities probably dictate that those times are few and far between, and your game suffers as a result. 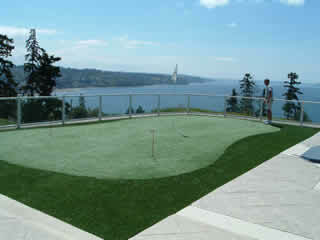 As a golf enthusiast adding a putting green to your home makes sense on so many levels. The most important reason is that it opens up the possibility of an entirely new practice routine, one that consists solely of walking out your back door. 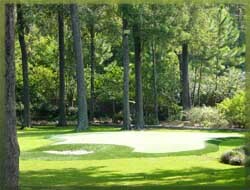 Installing a golf green at your home is a quick and easy process, but not as easy as it will be to access the game you love at a moment’s notice. In other words, if you’ve got the will to work on your game, we can give you the means. The rest, as they say, is up to you. Of course, installing a backyard green means your game isn’t the only thing that will look better. Think for a moment of the unique and aesthetically pleasing quality one will bring to your backyard. Talk about a gathering place for family and friends. 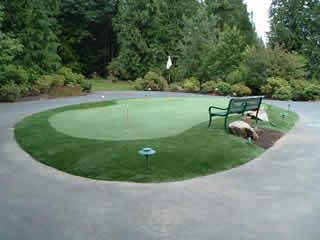 As the centerpiece of your backyard a green will provide a wonderful opportunity to share the game and your leisure time with those around you. Best of all, there’s no maintenance. No need for mowing, watering, fertilizing, or otherwise slaving away in the yard. Just sheer enjoyment and a flawless surface 365 days a year. If you’re serious about the game of golf, it makes sense to bring the game home with you. Make your backyard the cornerstone of your game while adding value to your home and leisure time in a unique and exciting way. It’s within reach, and just out the back door, with a little help from Southwest Greens.